Wondering what’s the most expensive shirt in the world? It’s made entirely out of gold! Keep reading! This coveted title goes to an Indian man who has purchased one of the most expensive shirts in the world. 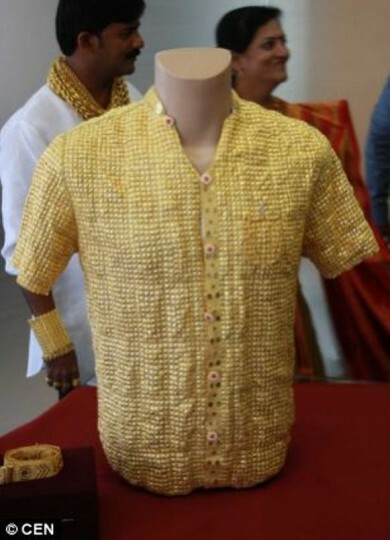 The specialty of the shirt is that it is made with over 3kg gold, priced at $250000. In his case, it is being obsessed with the most precious metal. 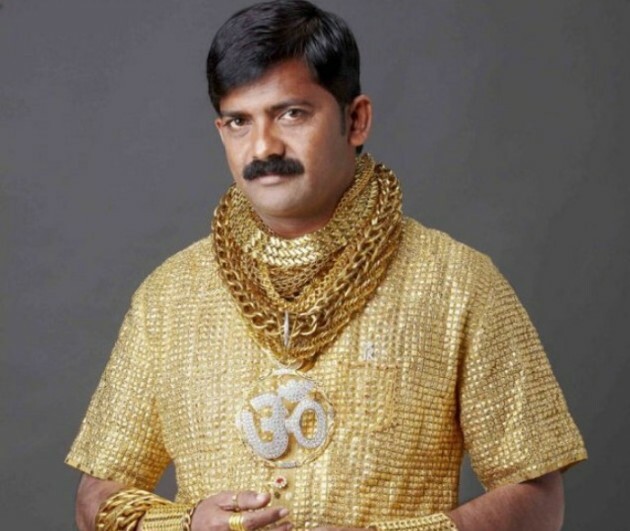 Datta Phuge is nicknamed the ‘gold man’ because his wrists, neck and knuckles are borne down with heavy bracelets, signet rings and a medallion which might be envied upon by someone like an Olympic champ. With all these he has accessorized his shirt of gold that is draped resplendently all over him and glittering in the light. The shirt weighs a staggering 3.3 kg, costing a decent quarter of a million dollars. To put it in mildest manner possible, it is a plush fashion statement, but nevertheless, for Phuge, it is a vital one. 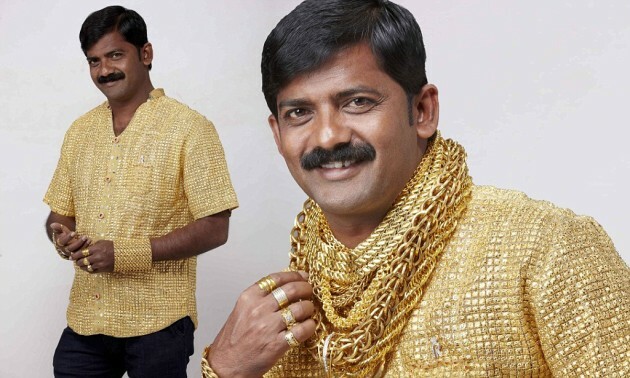 Wearing this much gold was his dream, just as people have different aspirations and wants to own a Mercedes or Audi. However, this man has 5 cars. He wears the shirt on special occasions like important functions and parties. Of course, the shirt elicits mixed reactions: while some are impressed, others look upon it like a snazzy display of wealth. It took 15 days and 16 people to prepare the shirt. Phuge has employed a security guard to make sure the shirt stays on his back wherever he goes. For the tailors, the challenge was to make the shirt as comfortable as wearing a normal one. So, they came up with a gold cloth sewn in Italian weave. For this, they used a special machine. Their inspiration was the ancient Indian kings who wore suits of armor. A velvet lining was put inside to prevent scratching. The completed shirt heavy and it clinks. It cannot be washed – so you need to protect against sweat and dirt, which is inevitable in the Indian tropical climate. According to the owner, wearing the shirt gives him a feel-good factor, as it is the ultimate hallmark of success, giving him the status he has always craved for since childhood. Since his college days, he heard people class you as being rich if you wore gold. He started wearing gold since Phuge was in college. Actually, he hailed from a humble background. He started as a property speculator and became a moneylender in Pimpri, based outside Pune. Every 6-8 months when there is a profit margin in his company, he purchases gold. His next target is a mobile that is made totally of gold, and this will be followed by gold shoes. Certain reports mention that Phuge wants to impress women with his shirt, but the man is happily married to Seema, a government sector employee, who shares his penchant. She owns 500 kg of gold including gold bags and necklaces. Phuge knows that he can sell his shirt, if he goes bankrupt someday. Gold in India is a symbol of power and prestige. People purchase the precious metal to be looked upon as flamboyant. 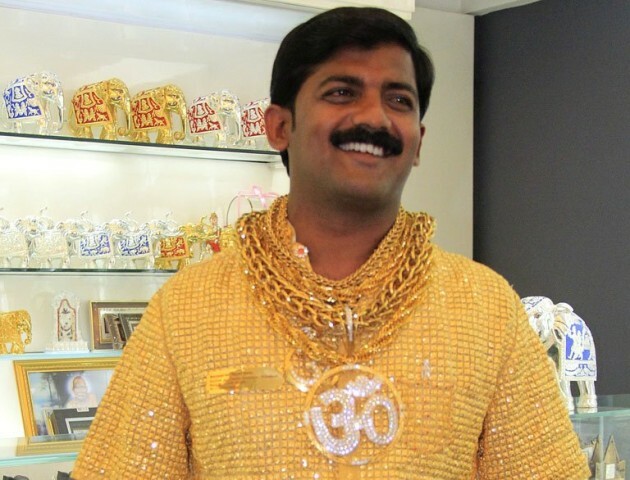 Meanwhile, the jewelers are getting further orders in gold belts and handbags with more Indians purchasing gold bars. I hope you enjoyed this article about the most expensive shirt in the world! Let us know what you think of it in the comments below!